Proper technique when painting on wood can produce a better finish. These techniques will also work for varnishing wood. Varnish, a clear protective coating either glossy or matte, can give the wood a colored protection and sometimes will even enhance the wood grain and patterns. However, the finished look of the wood will always depend on the surface and type of wood being treated. Apply a coat of white alkyd undercoat and let it dry for three to four hours. 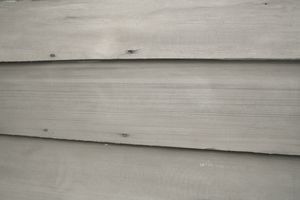 An aluminum wood primer is recommended when the wood is to be exposed to moisture. This type of primer will fill the wood pores and cavities in the wood. Apply two coats of alkyd enamel to finish your surface. Apply the first layer of finish, satin, semi-gloss or gloss, and allow it to dry. Remember to sand in between coats for a smoother finish. Note: If you use an oil-based primer, then you must use an oil-based paint. Oil-based paints and primers dry more slowly than do water-based paints and primers. If you're repainting an area, the first thing to do is assess the paint condition of the surface. If the paint is peeling, you must scrape it to remove old paint coats. Afterwards, the surface will need to be smoothed with 180 grit sandpaper to create a smoother surface. Never attempt to paint an existing wood surface without preparing its surface. Applying a direct coat of paint over the old coating will not work and eventually will tend to peel, especially if it has a glossy finish. Sand gently only to create a grip on the surface to be painted. Use a 280 grit to sand the surface. Remember to verify that the paint being removed is not a lead-based paint. If it is, special and additional steps must be followed as only authorized contractors should be able to remove the lead-based paint and dispose of it following federal regulations. Apply one coat of alkyd undercoat, and let it dry following manufacturers recommendations. Apply the topcoat, let it dry, and then apply the first layer of finish, satin, semi-gloss, or gloss, and allow it to dry. Sand in between coats for a smoother finish. The best advice for sanding in between coats is to start with coarser grit sandpaper and follow it up by a medium grit, and then finish with fine-grit sandpaper. A good tip: Spray a fine mist of water over the sanded surface that will raise the grain. Remember that the best way to sand is in the direction of the grain. Otherwise, it might damage your surface. The same advice goes if using an orbital sander; start with coarse and medium sandpapers and finalize with fine grit. What Are Bond Breakers Use for in Construction?